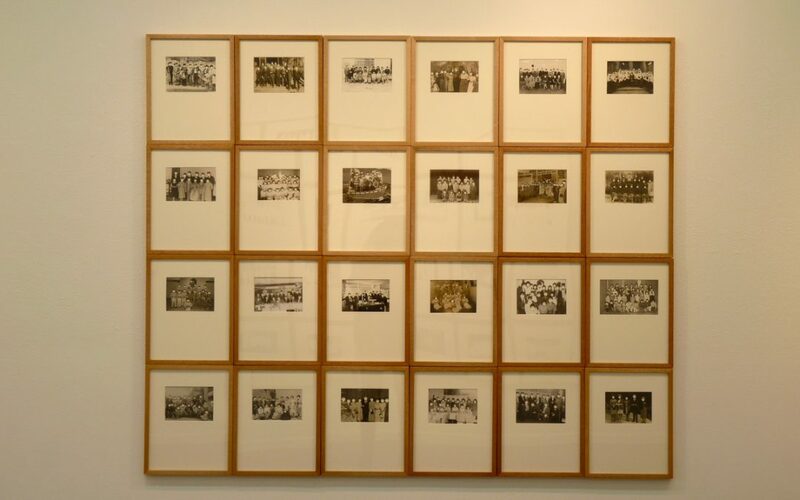 When regarding Presence, Alejandro Cartagena‘s compelling exhibition at Kopeikin Gallery, it is difficult not to be reminded of works by John Baldessari. 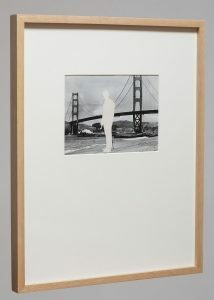 A fixture in Los Angeles, Baldessari is well known for removing silhouettes from found photographs and movie stills, or replacing heads with opaque colored circles. Based in Monterrey, Mexico, Cartagena uses photography to explore social, urban and environmental issues. Previous bodies of work included “Carpoolers” that focus images of riders in the back of pickup trucks captured from above as they zip along the road, as well as “Suburbia Mexicana,” photographs documenting the landscape and inhabitants of Mexican suburbs. In each image, Cartagena carefully cuts around the human the figures, stripping away their identities, while leaving the background intact. 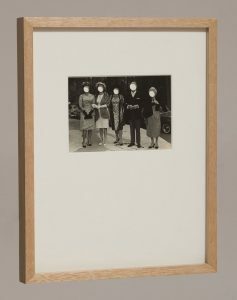 In one photograph from the “Groups”set, he cuts away the six diners seated at a table in a restaurant creating a void in the image. 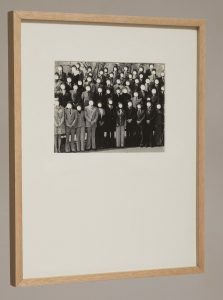 In another, an entire crowd that congregated to have their photograph taken on the stairs of a civic building has disappeared from the image. Cartagena’s removals include business men, soldiers, school groups and families, as well as those attending social gatherings. 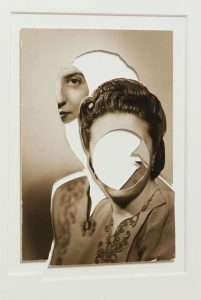 For the sub-set “faceless,” Cartagena creates circular voids obliterating each face in the photographs. 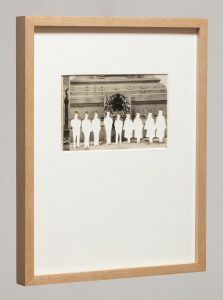 While many of these images are posed photographs documenting large groups, without facial features, they become collections of differing poses, outfits and hairstyles. This series calls to mind a film and a book of photographs entitled Killed by artist/filmmaker, William E. Jones. Jones re-presents photographs FSA director Roy Stryker rejected by punching a hole in the negatives. In Jones’ project, the holes become deep black circles appearing in the center of each image. 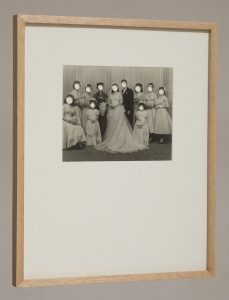 Cartagena’s “Dismembered”images began as studio portraits akin to modern daycartes de visites. Here, he separates the figure from the background, cuts the head from the clothing at the neck and punches a hole in the face. 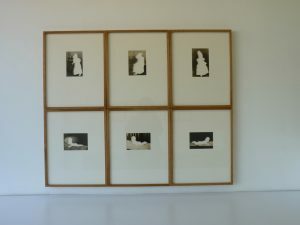 He then collages these pieces back together, offsetting them from their original positions. In Dismembered #8, he includes the woman’s face, a circular fragment peeking out from the empty backdrop. 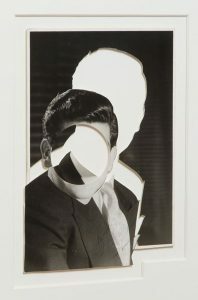 The three “Dismembered” collages stylistically recall the political photomontages of John Heartfield and Hannah Hoch who used collage to undermine Nazi propaganda. What is striking about Cartagena’s images is the personality and vitality the shapes of these missing silhouettes evoke. Though the images are devoid of the human body, its presence still resonates. Nino Haciendo Cosas #16 is a picture of a man sitting in a chair in a park or a garden, centered in the composition. Despite his absence, there is a calm and warmth to the image suggested by his body position. 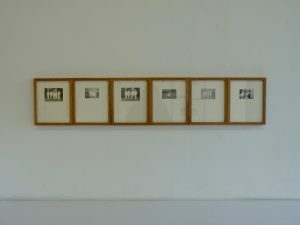 Similarly, Nino Haciendo Cosas #8, presents the shape of a figure leaning against an architectural column, one foot on the ground, the other resting against the support. Though the body has been removed, his shadow is present and helps to define the form of the missing figure.